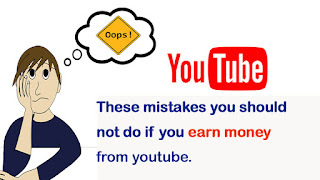 Friends, if you earning from youtube company or earn from google ad sense and depend on youtube earning, then please don't do these mistakes, friends these mistakes suspend your channel for a lifetime. Some mistakes that you do repeat much time in the day. 1):-Please don't watch the video again and again. 2 Download youtube studio app from google play store for views, watch time, subscribe etc. 3):- Remember that do not use the title tag of someone else's video. 4):- Please note that do not use the wrong language in the comment box. 5):- Do not use sub and sub. 6):- Do not use the wrong tag in the video for video ranking and if you use the wrong tag in the video then your channel any time suspended without any notice. 7):- Do not use someone's the channel name in the description. 8):- Create a channel on your name.